Looking for fun activities in Pattaya? On this page are just a few of the things you can do while you are in Pattaya. At the bottom of the page you will find links to other pages as well. A great place for a day out and one of Pattaya's activities. 130 meters tall Buddha image carved into a Mountain. This makes it the largest Buddha Image in the world. It is 130 meters tall and 70 meters wide. The carving is inlaid with gold and has been carved into the rock by laser technology in 1990 and was officially opened in 1993 by His Majesty King Bhumibol. 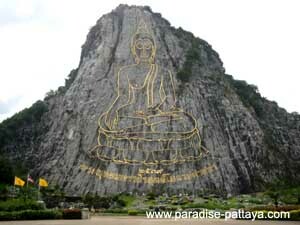 Check out the Pattaya Buddha Mountain or Khao Chee Chan is next to the temple compound of Wat Yansangwararam. One of the must do activities in Pattaya. Located on an over 70 acre this Park and farm has been created over the past 20 years. It offers several amusing and exciting shows. The most famous is the crocodile show and it is impressive to watch the crocodiles. 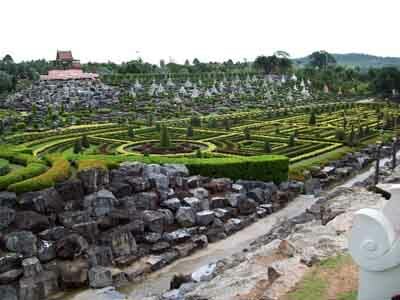 It has gigantic rock gardens, exotic plants, ponds and flower gardens. 5 km from Pattaya, demonstrate Elephant skills in hauling logs, re-enactment of war Elephants in historic battles and parades. Watch the Elephant afternoon football match! They offer Elephant back trekking, Jungle Walking and Rafting. Learn to go scuba diving with the Pattaya Adventure Divers. There is a one day course if you want to try diving. If you want to go further they offer a 4 day Padi open water certification course. For the experienced diver, there is wreck diving and excellent diving around Pattaya's islands. They offer also Padi Rescue Diver courses, emergency first response and diving careers. In any case you're bound to have fun in this part of the world. Find out more on what you can do to have a good time here!